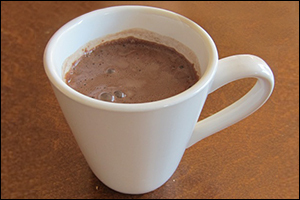 In a microwave-safe mug or glass, combine cocoa powder, chocolate chips, sweetener, cinnamon, and cayenne pepper. Add 1/4 cup very hot water, and stir until mostly dissolved and uniform. Add milk and another 1/4 cup hot water, and mix well. Microwave until hot, about 45 seconds. HG Iced Alternative: For an equally delicious iced Mexican cocoa, try this... When you add the milk, add 1/4 cup cold water, not hot. Then serve over ice. Hungry (or Thirsty) for More? 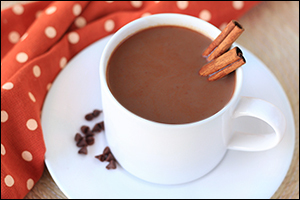 Pass a cup of cocoa! Click "Send to a Friend" to share this recipe now. Not in the mood for all this hot stuff? Maybe that's because it's National Cold Cuts Day, March 3rd. Scope out lean options, like Applegate Naturals and the American Heart Association's picks from Boar's Head!